Sometimes it's hard to be a woman and sometimes it's time to be a hard woman . . . This is a book for all those times. 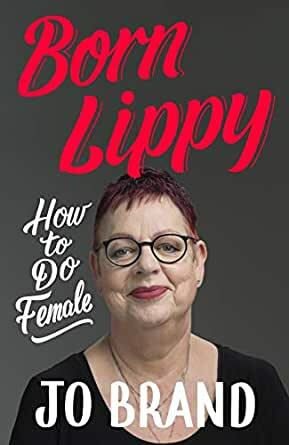 Once upon a (very very) long time ago Jo Brand was what you might describe as 'a nice little girl'. Of course, that was before the values of cynicism, misogyny and the societal expectation that Jo would be thin, feminine and demure sent her off down Arsey Avenue. Born Lippy is a gathering of all the things Jo Brand wishes she'd known, all the things she's learnt, and all the things she hopes for the future. A century after women got the vote (albeit married women over the age of 28) it's time to take stock of exactly what it means to be female today. And if there's one thing women are entitled to, it's having a bloody good moan about things big and small - so here goes . . .
HOW TO MANAGE A BULLY * YOUR FAMILY AND HOW TO SURVIVE IT * WHAT NO-ONE TELLS YOU ABOUT THE FEMALE BODY * BEING DIFFERENT * SOCIAL MEDIA IS NOT SOCIABLE * HOW NOT TO FALL IN LOVE * FEMINISM: A RE-BRANDING * ADVENTURES IN YOUR HEAD * HAVING FUN * NOT HAVING FUN: WHAT TO DO WHEN IT ALL GOES WRONG * STAYING SANE * YOU ARE NOT WHAT YOU WEAR * MODERN MANNERS* HOW TO DO WHAT YOU WANT: OR NOT DO WHAT OTHERS WANT * BEING HEALTHY * GETTING ON A BIT * THE FEMALE OF THE SPECIES: MORE DEADLY THAN THE MALE? Read all her books but this one kind of descended into a boring advice book. Needless to say I could t be arsed to finish it. More humour needed.